Package includes: Model No. 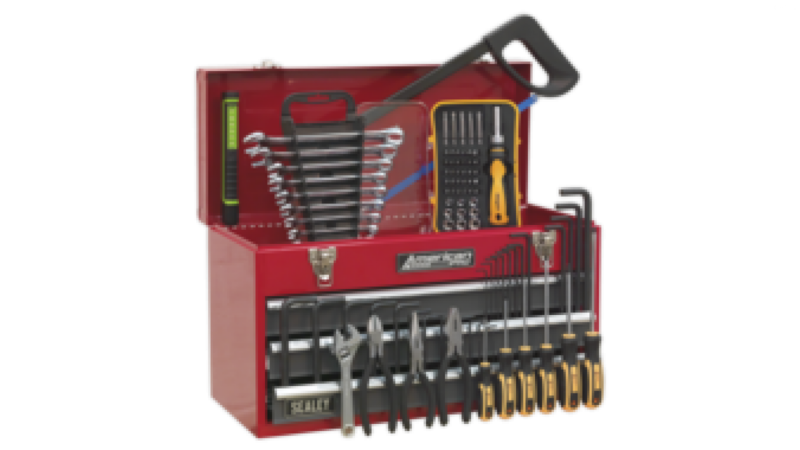 AP9243BB Topchest 3 Drawer Portable with Ball Bearing Slides - Red/Grey Overall Size (W x D x H): 510 x 225 x 300mm 93pc Tool Kit Model No. - Description LED028 - Magnetic Pocket Light 6 SMD + 1 LED S0447 - Pliers Set 3pc S0450 - Adjustable Wrench 150mm S0465 - Hex Key Set 25pc S0481 - Hacksaw 300mm S0615 - Soft Grip Screwdriver Set 6pc S0562 - Combination Spanner Set 11pc Metric S0979 - Socket & Bit Set 45pc Ratchet Screwdriver Other products of equivalent value will be supplied in the event that the promotion items should cease to be available. You may also refer to the individual Model No. for full specification.